In early March 2015, WA Environment minister Albert Jacob granted Canadian uranium producer Cameco approval to develop the remote Kintyre deposit. The approval occured even though an investigation is still underway regarding the Western Desert Lands Aboriginal Coporation's (WDLAC) operation and a mountain of appeals have been lodged against the development. The Kintyre uranium project was referred to the Commonwealth for assessment under the Environment Protection and Biodiversity Conservation Act 1999 (EPBC Act) in 2010. The assessment of the project has been undertaken by the Western Australian Government under the bilateral assessment agreement which addresses both state and Commonwealth requirements. The proposal was approved by the Western Australian Government on 4 March 2015 and now requires final consideration under national environmental law. The project still requires approval from federal envionment minister Greg Hunt before it can go ahead. Click here to view Robin Chapple's appeal against the Kintyre Uranium Project August 2014. It is within this regulatory framework that the government has recommended the proposed Kintyre Uranium Mine, the first of its kind to be implemented in WA. The current and previous governments have failed to adequately regulate the mining industry in general in WA, and this raises the question about the government’s ability to regulate the uranium mining industry. The WA Auditor General’s Report 8, ‘Ensuring Compliance with Conditions on Mining’ tabled in Parliament September 8, 2011 identified the failure of government agencies to adequately monitor and assess mining compliance and environmental performance. Problems were specific to the Department of Mines and Petroleum’s (DMP) planning and management of mines inspection; failure to enforce environmental policy and conditions; and regulation of tailings. Robin strongly urged the Minister to acknowledge the serious problems with the environmental impact assessment of the proposed Kintyre Uranium Mine to date, and to reassess the proposal. It is of serious concern that the EPA has not recommended that any conditions be imposed with regard to certain environmental impacts, such as radiation. Minister for Mines and Petroleum, 20 May 2012, State Budget 2010-11: World’s best practice will rule uranium sector [Media statement]. Uranium Advisory Group, April 2012, Volume 2: Independent Review of Uranium Mining Regulation, p.vii. 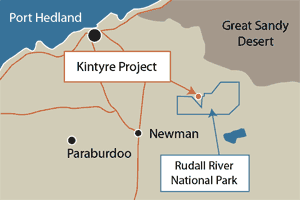 The Kintyre Uranium project is located in an area close to the Karlamilyi National Park encompasses spinifex plains, red desert sands, salt lakes and ancient gorges that protect pristine rock pools and swimming holes. In March 2011 indicated resources were updated to 25,600 tonnes U3O8 at 0.49%, and inferred resources of 2400 t at 0.47%.The property was acquired in 2008 by a joint venture between Cameco Corporation and Mitsubishi Development Pty Ltd. The project is operated by Cameco Australia Pty Ltd, a wholly owned subsidiary of Cameco. To break even, the project would need an average realised uranium price of $US67 per pound or 62 Mlb of production over its life, as opposed to 40 Mlb currently. The project’s Environmental Review and Management Programme is currently under assessment before the EPA. Submissions closed on 14 February 2014. Close proximity to the Karlamilyi (Rudall River) National Park and the Karlamilyi catchment area - an area which never should have been excised from the National Park. High level of risk to stygofauna (rare and poorly-understood subterranean fauna) from pit dewatering, excavation, contamination, blasting and changes in water recharge. Several other uranium mining companies are buying up tenements close to Kintyre in the hope of finding uranium seams off the main Kintyre deposit − including De Grey Mining. The Greens will continue to oppose the Kintyre Uranium.